Home / Gellert Bath FAQ / Is Gellert Spa Mixed? 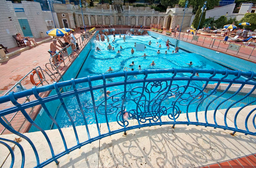 Gellert Spa has turned into a mixed spa bath complex on January 01, 2013. Before that, men and women had separate thermal pools, but it is no longer an available option for those seeking a men only or women only bath. As Gellert Spa & Thermal Bath has become a coed bath palace, men and women are allowed to enter the baths together at the same time at any time. You can book a couple’s massage or a double massage in the double room in Gellert Spa & Baths online. The package deal for 2 people means that the 1 hour VIP massage treatment is cheaper than if bought separately. Each double massage package includes the treatments for 2 people, 2 bath entries, 2 private cabins for getting changed and storage. If you are planning to visit Gellert Spa with your spouse, you might be interested in the special Private Bath for 2 persons, where you can spend 3 hours privately with a glass of champagne. Gellert Spa is open every day (Mon-Sun) from 6 am to 8 pm. Currently the only thermal bath in Budapest with men only and women only days is in Rudas Bath. How many pools/baths do you have? And what temperatures are they?